I only have two more prompts left until I finally complete the 31 Day Challenge! I think tomorrow I will just do the rest of the prompts to finish it off. I really want to get back to swatching since I have some new colors to show everyone and nail art. I have a bunch of ideas for nail art now that I got some inspiration from the challenge. So look out for that tomorrow! 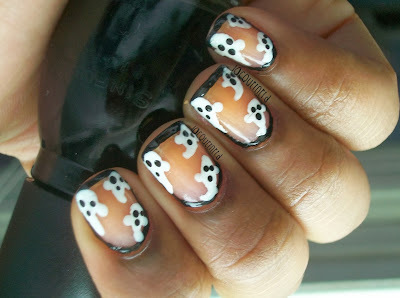 Anyways, for supernatural nails I did ghosts. I've never seen a ghost before but I like hearing ghost stories, reading about them, and I believe in ghosts. It's pretty interesting to me. 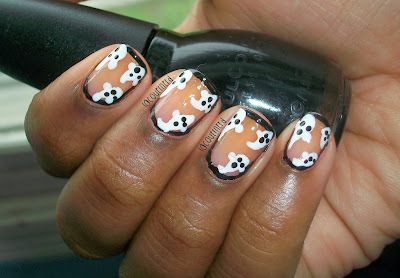 For this design, I did frame nails with ghosts around the nail. I'm giving you a warning because my nails are pretty yellow from doing my nails everyday with the challenge, so I apologize for my yellow nails in advance lol. For my supernatural nails, I first made the "frame" using Sinful Colors Black on Black. I used my detail brush for this. I basically just outlined the nail with the brush. You don't want to make the frame too thick, but not too thin either or you won't be able to see where the frame is. The ghosts were made with dotting tools. With Wet n Wild's French White Creme, I first made a teardrop shape with the dotting tool. At the tip of the drop, I made a slight curve to finish off the ghost. Another way is to just make the tip a little longer if you don't want to do the curve. Finally, I finished it off with a top coat. 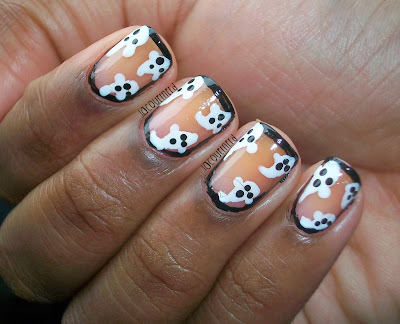 You can also put glow in the dark polish on the ghosts to make them glow to add to it. I really like these nails. They came out exactly how I wanted them to, even if my nails are so yellow. This is the first time that I've successfully done frame nails as well. I will be doing more frame nails in the future with different colors. It looks really cool. What do you think of this design? Do you believe in ghosts? Tomorrow is a tutorial and honor nails you love! Almost done with the challenge!